Christmas at The Rocks – Volunteers Needed! 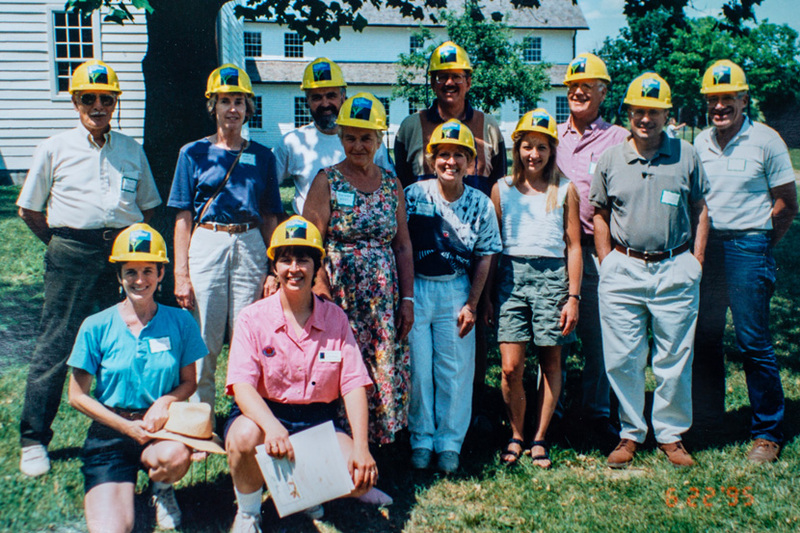 Our Land Steward Program celebrates its 25th Year! 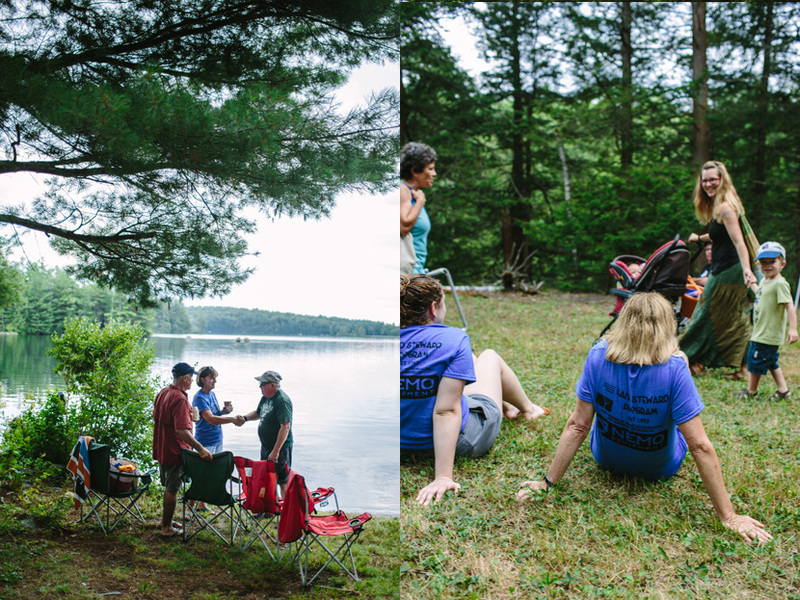 Land Steward Karl Putnam says "camaraderie" is the best word to summarize his experience volunteering with the Land Steward Program in the Granite State. What's full of camaraderie and fun, and makes you feel young? Grab a pair of sturdy shoes, throw on some clothes for getting dirty, and meet me at the trailhead to find out. I'll never forget my first time hiking with a purpose. I packed my bag just like any other day on the trail, including a lunch, snacks, and plenty of water. New to me were the pair of loppers and handsaw that I carried in each hand to trim branches from trees growing into the trail. The experienced trail workers in my group showed me how to prune branches and saw saplings. They shared tips about how to avoid black flies and prevent blisters. Despite their advice, I ended the day with more than a few bug bites and the biggest blister I'd ever had. Blast from the past: The first Land Steward Program Coordinator, Beth McGuinn, right, enjoyed a sweet reunion with friends Roger and Ann Sweet at the program's recent 25th anniversary celebration. More importantly, I made great memories and new friendships. Trail maintenance and other types of environmental stewardship help ensure special places are treated with kindness and respect. They also provide a path to connect and share one's passion for nature with like-minded people. I recently attended the 25th anniversary celebration for the Forest Society's Land Steward Program and got a chance to learn what motivates many long-time (and newer) volunteers. Len Martin recalled his first workday tearing down a shed at a newly conserved forest reservation. 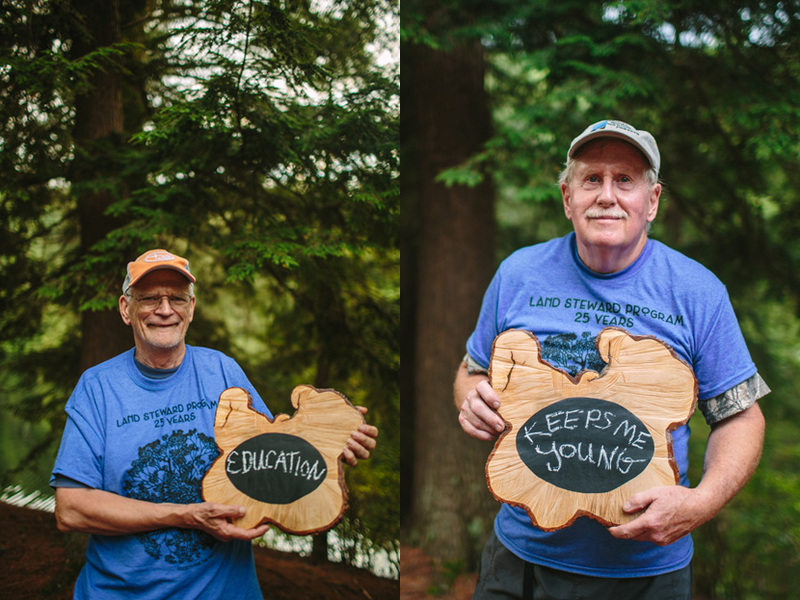 "It was a lot of work, but a lot of fun," Len said, remembering that two of the land stewards he first met that day he still sees at volunteer events to this day. Now he considers the group almost like family. The Forest Society's Land Steward Program started small, but eventually expanded to increase the capacity of our staff. It's a model for other nonprofit organizations across the country. Land stewards are the eyes and ears for the Forest Society's 185 reservations across New Hampshire. They visit our properties annually to make sure they are not misused or abused. They also do much more. Land Stewards John and Jackie Stetser say "vigilance" is the best word to describe the way they and their neighbors keep a watchful eye on the property they steward. The Moose Mountains reservation in Middleton was once subject to trash dumping, off-roading, and vandalism, and had little-cared-for and unmarked trails. Since training to be land stewards in 2011, volunteers Jason Morris and Scott Lavoice have built footpaths up to scenic vistas, helped clean up a former dumping site, pruned trees, installed trail signs and led community hikes. They've encouraged responsible use by being a watchful and regular presence on the property. "The neatest thing is seeing the local people here and just hearing them say how awesome it is that there are trails and signs and blazes. That makes it worth it," Jason said. Roger and Ann Sweet fondly remember the workdays. "We would meet at a Forest Society property and hike up to wherever we were going to do a project," said Roger. The land steward coordinator at the time, Beth McGuinn, would often bring a surprise, like strawberry shortcake. "It was always a lot of fun. We accomplished a lot, learned a lot, and enjoyed a whole variety of different properties as a result," Roger said. "I've met a lot of really nice people," said land steward Ben Haubrich. 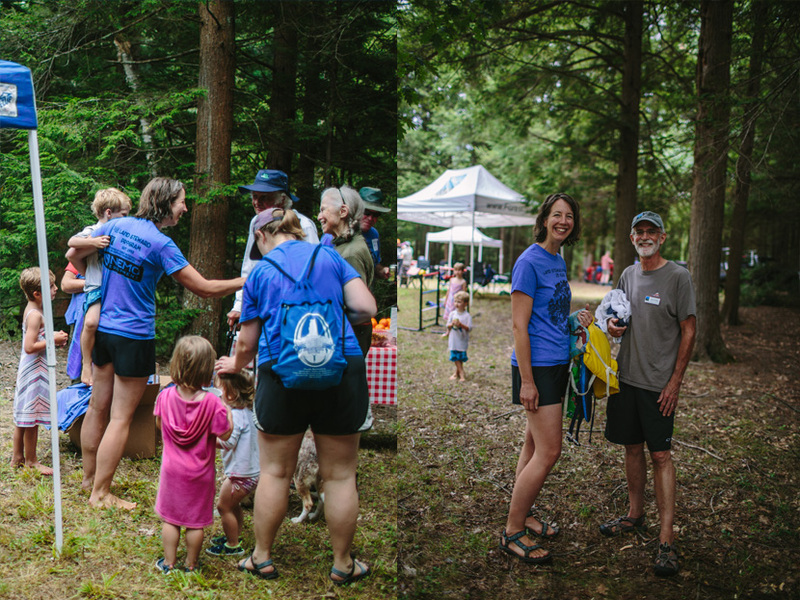 Last year, Ben worked with the Francestown Land Trust and Francestown Conservation Commission to hold a public hike introducing new people to High Five, the reservation in Deering that he stewards. "We had people 3 years old and 85 years old and they loved it." The Forest Society welcomes new land stewards with a 2-day training each spring, and offers volunteer opportunities throughout the year. The Land Steward Program "workdays" are single-day events where you can meet and work alongside our land stewards - no experience required. The Forest Society posts upcoming volunteer workdays on a website called NatureGroupie.org, which compiles outdoor volunteer opportunities from hundreds of organizations like the Forest Society in New Hampshire and New England. 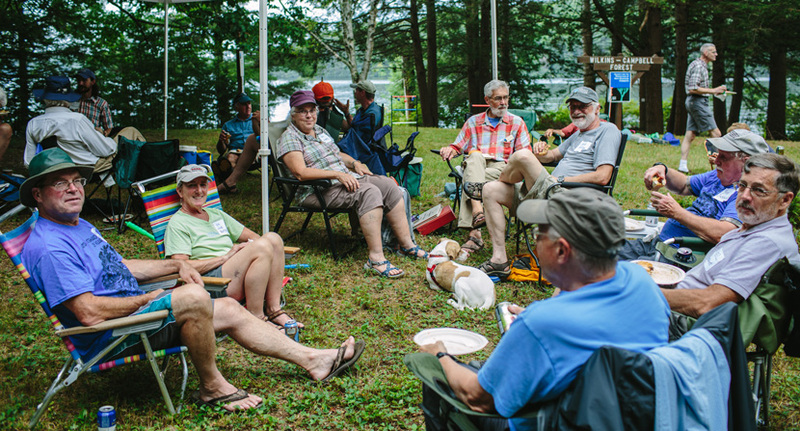 The staff at Nature Groupie, based at UNH Cooperative Extension, report on the volunteer action including the number of people who sign up to attend workdays. This spring was the busiest yet with 177 events and 786 volunteers signing up to lend a hand, according to the site. "We're getting other people involved and we're expanding our reach," said Len Martin, who volunteers for other environmental organizations as well and is a part of the Nature Groupie community. Try hiking with a purpose yourself at one of our upcoming workdays on Aug. 21, Sept. 5, or Sept. 8. Learn more and sign-up at forestsociety.org/events or naturegroupie.org. Love camaraderie and fun? 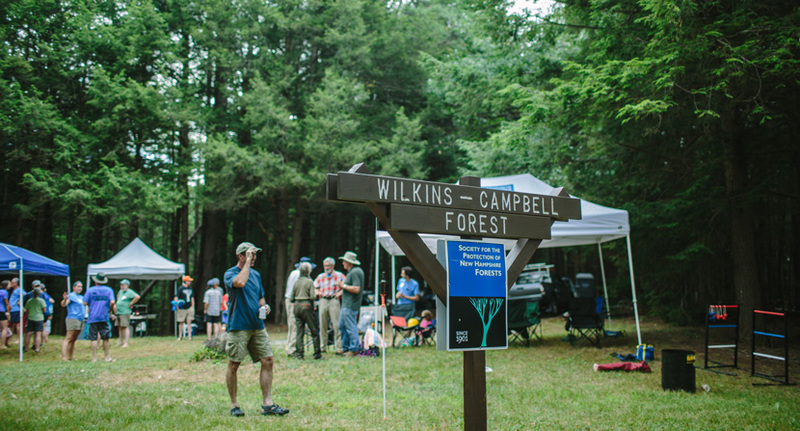 Explore more photos and history from the Land Steward 25th Celebration at Wilkins-Campbell Forest in Deering by scrolling below. Many thanks to Nemo Equipment for sponsoring our 25th Anniversary Land Steward t-shirts! 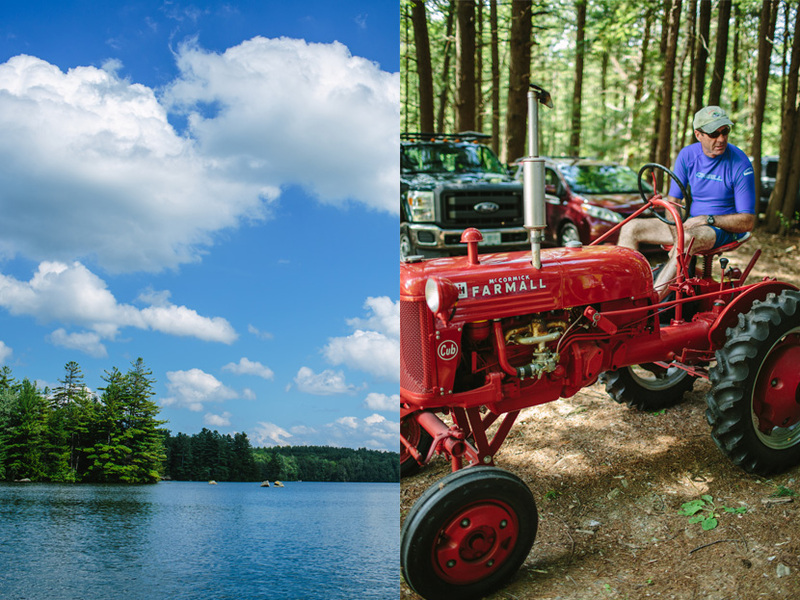 Bob Macentee arrives in style at our scenic Wilkins-Campbell Forest on the Deering Reservoir, where Bob is also the steward. 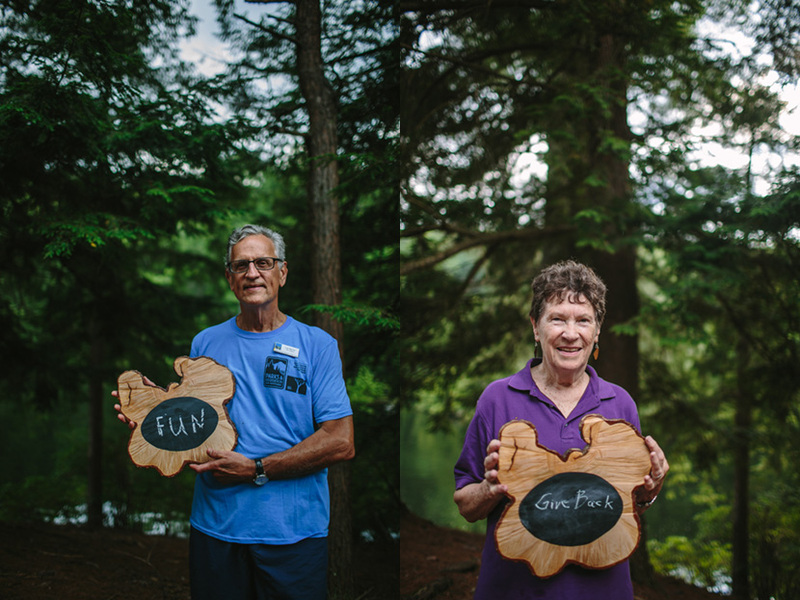 Joslin Bennett (left) and Paul Doscher (right), are former and current Land Stewards and also former Forest Society staff! 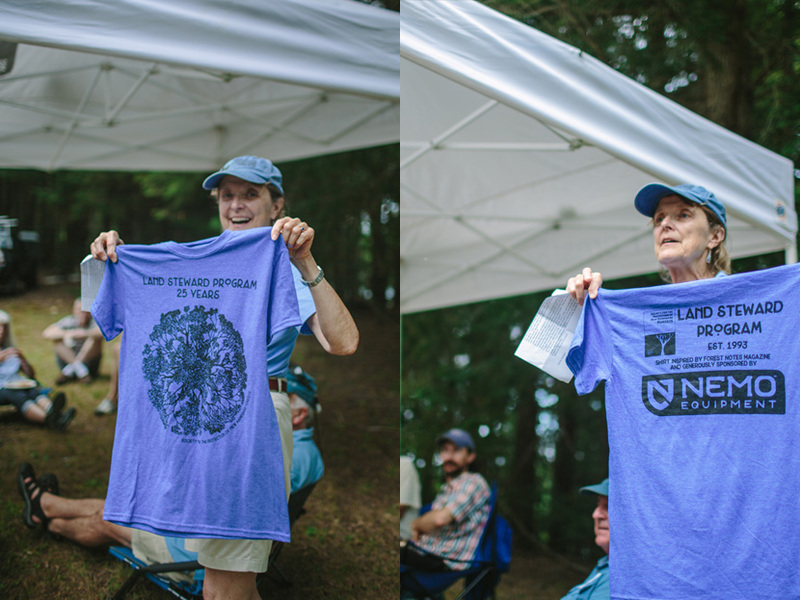 Jane Difley, Forest Society President/Forester, proudly displays the commemorative t-shirt design inspired by an early 1970s Forest Notes cover. Thanks to Nemo Equipment for sponsoring the shirts! 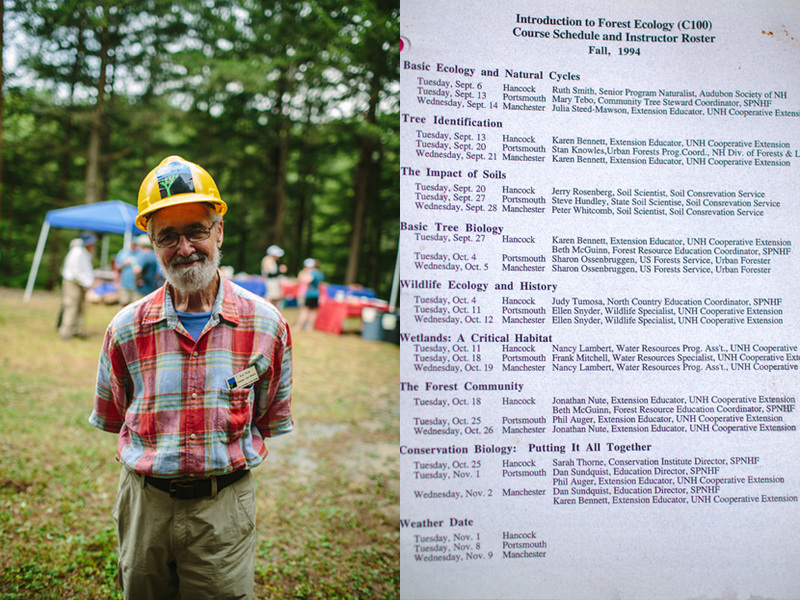 Land Steward Bud Ross brought his original hard hat and course schedule for the Land Steward Program circa 1994. Nowadays Land Stewards take a 2-day workshop. Land Stewards Lee Baker (left) and Ray Jackson (right) summarize their Land Steward experience with (almost) one word! To learn more about the Land Steward Program and the next training or to hear about upcoming trail crew workdays, contact Andy Crowley, Land Steward Program Coordinator at acrowley@forestsociety.org or 603-224-9945.